How many umpires do they need? 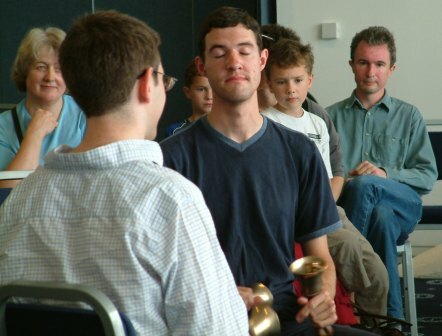 Apart from the occasional after-dinner touch, change ringing on handbells is usually performed in quiet seclusion for the benefit of the participants alone. 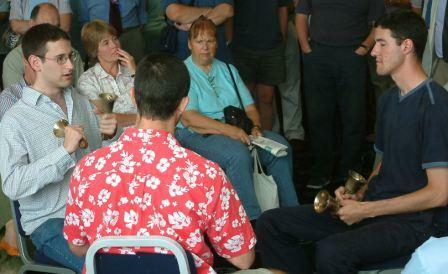 The 2005 Ringing Roadshow was somewhat different! Four exhibition touches and a handbell peal performed in front of a large audience together with two handbell practices open to all. 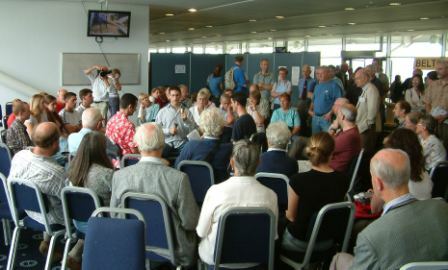 The morning and afternoon open practices provided an opportunity for anyone to “have a go” and numerous visitors rang various methods ranging from Rounds and Plain Hunt on six for their very first ring on handbells, through to firsts of Spliced S Major, Bristol S Royal and Little Bob Maximus. The programme of demonstration touches was quite ambitious as each band included ringers from various parts of the country, many of whom had never rung together before. Performing under the close scrutiny of a large audience in a very warm environment with the high level of ambient noise from the top floor of the Grandstand provided a further challenge. Although all the demonstration ringers had previously rung peals in the methods, there was no chance to practice beforehand, so many had not rung the chosen methods for some time. Ringing on sixteen handbells is still uncommon, so it was the first time in over four years that most of the band had rung on that many bells. It was therefore with some relief to the organiser when the demonstrations of 8-Spliced S Major, Stedman Cinques, Bristol S Maximus and Kent & Oxford TB Sixteen all came round successfully to loud applause. Andrew Tibbetts conducting in his sleep! Another first for the 2005 show was the public peal on handbells rung by the record-breaking band of College Youths who last year rang 50400 Treble Dodging Minor taking over 17 hours - the most changes ever rung in a peal; and earlier this year, 20880 Spliced Treble Dodging Minor in 1053 methods - the most methods ever rung in a peal. This provided an opportunity to observe how this band is able to maintain such high quality ringing over such a long period of time. It was fascinating to watch, and there was a large audience throughout; some staying for the entire peal despite the draw of other attractions around the show. Philip Earis, on the trebles, appeared to be thoroughly enjoying himself, as he looked around and smiled at onlookers. David Pipe, ringing 5-6, exhibited detached concentration as he looked at the floor for long periods. Yet he was fully absorbed in the ringing and clearly aware of what was going on around him. Andrew Tibbetts, on 3-4, demonstrated such a relaxed grip he hardly seemed to be holding the bells at all. As the photograph illustrates, he also appears to be able to ring and conduct while fast asleep – clearly a valuable skill for ringing very long lengths! During the sixth extent he asked the audience whether they had any requests for the last extent. No doubt they would have been able to accommodate almost any suggestion. The band appeared completely relaxed and unfazed by the presence of the large audience which grew to a considerable size as the peal neared its conclusion. As the peal came round there was a huge cheer, loud applause and whistling, that made one appreciate how much this youthful band has achieved over the last couple of years to earn its celebrity status. The only real snag on the day (Roadshow 2008 organisers take note) was the high level of background noise from the open top floor of Grandstand. This made it difficult for the audience to hear both the bells and the introductions properly, and even the ringers found it difficult to hear the large and heavily damped tenors across a sixteen-bell circle. So did the stand achieve its own objective of promoting change ringing on handbells and inspiring new or lapsed handbell ringers? Hopefully the answer is “Yes”. There were large numbers watching and participating throughout the day, and judging from some of the comments received at the event and by email since, some have indeed gone back home with renewed vigour to get the handbells out again. Article also published in The Ringing World, issue 4929, 14 October 2005. This page was last modified on 17 December 2010, at 15:07.